Following the purchase of the two co-located events by the National Association of Broadcasters (NAB), SATCON is attracting key players and conference sessions for the 13th consecutive year. Following the purchase of the two co-located events by the National Association of Broadcasters (NAB) at the end of last year and a 22 percent increase in overall attendance, SATCON is attracting key players and conference sessions for the 13th consecutive year. “We are excited about the positive response we have received from attendees, exhibitors, sponsors, advisory board members and industry partners to this year’s show and the higher global visibility that SATCON and CCW will have as part of the NAB family of world-class trade shows and conferences,” said SATCON Event Director and CCW+SATCON Sales Director, David Reynolds. NAB is known throughout the broadcast, media and entertainment community for creating events offering high-impact experiences which they will now bring to CCW+SATCON, an event that already boasts a unique educational and high-touch networking opportunity as the East Coast’s leading content and communications event. Reynolds and the NAB conventions team are working closely with the SATCON advisory board to deliver: A full range of next-gen technology on the exhibit floor; cutting-edge sessions designed to expand knowledge and skills and provide actionable information; and valuable opportunities throughout the two-day event to exchange ideas and discover solutions not found anywhere else. 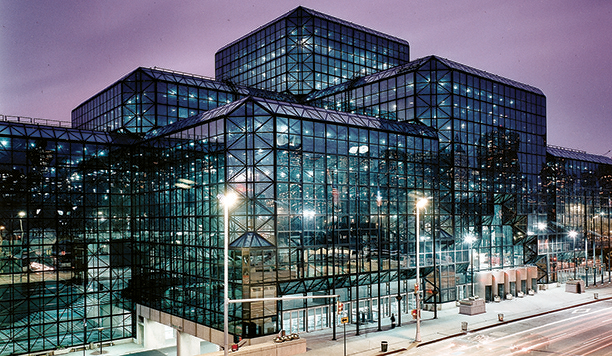 The Javits Convention Center at night, site of the 2014 SATCON Conference and Expo. New for 2014, SATCON will offer a two-hour MILSATCOM Acquisition Workshop addressing the lessons learned from recent satellite acquisitions and how the deals were done. The SATCON expo will feature the latest products and services from the major satellite operators and carriers, service and network providers, equipment manufacturers and integrators. Exhibiting companies will be showcasing everything from satellite antennas, down/up converters, modems, switches and test equipment to ENG/SNG, engineering services, IP Network Solutions, military satcom applications, mobile satcom, satellite services, distance learning solutions and everything in between. All CCW+SATCON attendees will have access to both events’ conference programs and exhibits, making it a well-rounded educational and networking experience for satellite communication professionals. 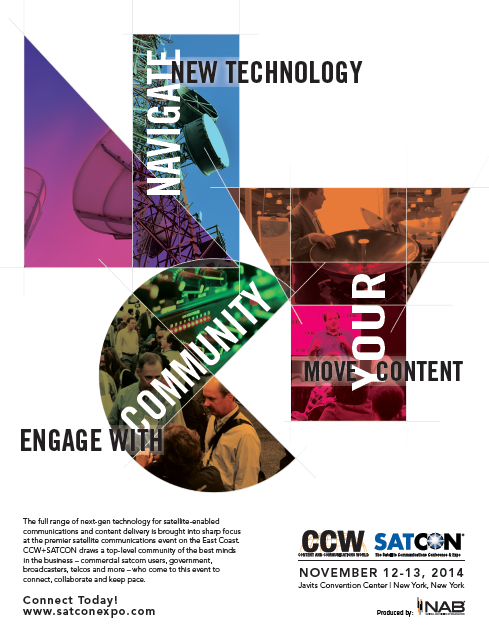 “An added value to SATCON attendees is the access to the CCW exhibits, conference sessions and vendor presentations, which will provide the latest information on content creation, management, distribution and delivery. 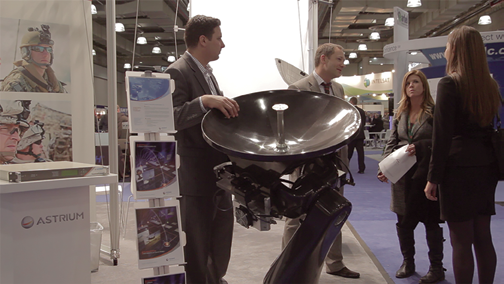 If you are an end-user of satellite-enabled communications or an satellite industry executive, SATCON will provide you with a great opportunity to make personal contacts, network and gain valuable insights from the experts. Attendees will have networking receptions at the end of each day on the exhibitor floor and a special event for the Vision Awards winners on day one,” said Reynolds. 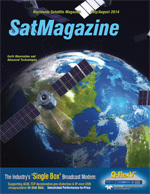 Now in its third year, Satellite Markets and Research will be granting the Vision Awards at SATCON to deserving individuals, companies and products in the satellite industry in the following categories: Visionary Executive of the Year; Most Promising Company of the Year; and Most Innovative Product or Service of the Year. The winners of the 2014 Vision Awards will be awarded during a reception ceremony on November 12th from 6:00-7:00 pm. All SATCON attendees are invited to attend.